Fox Glacier Hiking Trails has been added to your itinerary. Start off your visit on the 18th (Tue): kick back and relax at Gillespies Beach and then stroll through Fox Glacier Hiking Trails. Here are some ideas for day two: take your sightseeing to a higher altitude at Fox Glacier, then take an unforgettable tour with a helicopter tour, then take in the dramatic natural features at Franz Josef Glacier, and finally identify plant and animal life at West Coast Wildlife Centre. To see traveler tips, maps, more things to do, and more tourist information, you can read our Fox Glacier trip planner. Singapore, Singapore to Fox Glacier is an approximately 20-hour flight. You'll lose 4 hours traveling from Singapore to Fox Glacier due to the time zone difference. Finish your sightseeing early on the 20th (Thu) to allow enough time to drive to Te Anau. Visiting Fiordland National Park (Te Wahipounamu) and Punanga Manu o Te Anau will get you outdoors. The adventure continues: take a memorable drive along Milford Sound, explore the activities along Doubtful Sound, take your sightseeing to a higher altitude at Mitre Peak, and take an unforgettable tour with a helicopter tour. To see more things to do, other places to visit, and other tourist information, read Te Anau custom trip planner. Getting from Fox Glacier to Te Anau by car takes about 6.5 hours. Other options: take a bus. Finish your sightseeing early on the 24th (Mon) so you can drive to Queenstown. 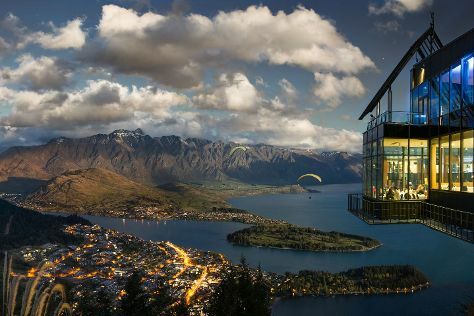 Escape the urban bustle at The Remarkables Ski Area and Coronet Peak. There's lots more to do: soothe aching muscles at some of the top local wellness centers, take in the exciting artwork at Queenstown Arts Centre, tee off at Queenstown Golf Club, and learn about winemaking at Chard Farm Winery. For traveler tips, more things to do, reviews, and more tourist information, go to the Queenstown holiday planner. Traveling by car from Te Anau to Queenstown takes 2.5 hours. Alternatively, you can take a bus. Finish your sightseeing early on the 28th (Fri) so you can travel to Rotorua. 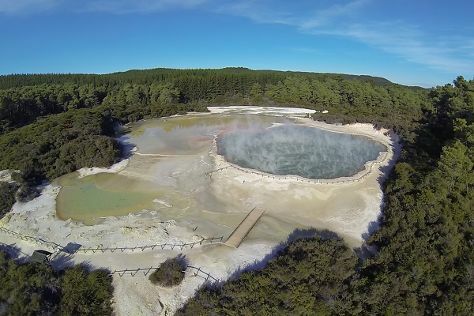 Get in touch with nature at Wai-O-Tapu Thermal Wonderland and Rainbow Springs Nature Park. Explore Rotorua's surroundings by going to Taupo (Huka Falls tracks & Kinloch Beach). Spend the 29th (Sat) immersed in therapeutic waters at a local thermal spa. There's still lots to do: kick your exploration up a notch at some of the top local zipline courses and adventure parks, do a tasting at Volcanic Hills Winery, contemplate the long history of Tamaki Maori Village, and get a dose of the wild on a nature and wildlife tour. To find where to stay, traveler tips, reviews, and tourist information, go to the Rotorua travel itinerary creator. You can fly from Queenstown to Rotorua in 6 hours. In July, daytime highs in Rotorua are 17°C, while nighttime lows are 7°C. You will have some time to spend on the 1st (Tue) before leaving for home.